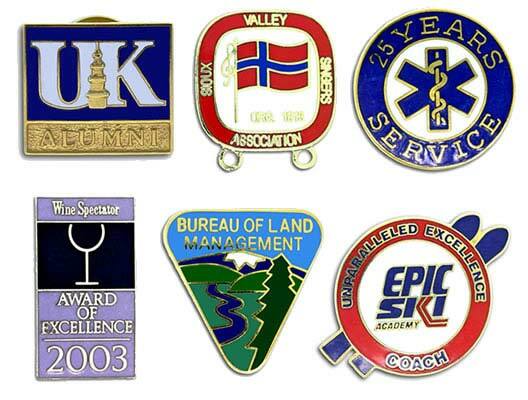 Cloisonne Custom Lapel Pins are an excellent choice for a quality lapel pin because they provide. We bring our professional design team with their experience and talent directly to you. We work for you. You approve your custom design every step of the way. Peace of Mind. We are Based in the USA & Quality Assurance is our promise. Proof within 24 business hours of receiving your art file or your requested design. Factory Sample emailed to you within 5-10 business days of receiving your proof approval. Your Pins to you within 15-20 business days once you approve the final sample. Let's Create Your Lapel Pins! Send us your project's details and we will help you make your custom pins look great! High amount of details. Cloisonne lapel pins are die-struck into copper, a soft metal that allows us a more detailed impression. Custom Shapes and Cut-Outs available. Each copper piece is cut to the exact outline of the design. Rich and bright colors. Cloisonne colors are hand filled with a powdered glass-like mixture. 144 colors available. Long lasting Cloisonne colors that won’t bleed: Cloisonne lapel pin colors are fired at 1600F, which hardens the pigments and prevents any other colors to enter the recessed area. Cloisonné lapel pins may cost more than Classic Hard Enamel. Clearly separated Cloisonne colors. Using a pumice stone wheel, each pin is polished, eliminating any excess of cloisonne pigments. Jewelry-like look. Using a softer polishing wheel, each lapel pin is polished, enhancing its luster and smoothness. Wide variety of attachments. An attachment is welded to the back of each pin. Our standard attachment is the butterfly clutch. Other attachments available. Great perceived value. Each piece is dipped into the gold or silver plating, which adheres to the exposed base metal, converting the raised walls to the shiny look of the metal. Packaging and shipping. All of our lapel pins are individually poly bagged to preserve them from scratching against each other during shipping.